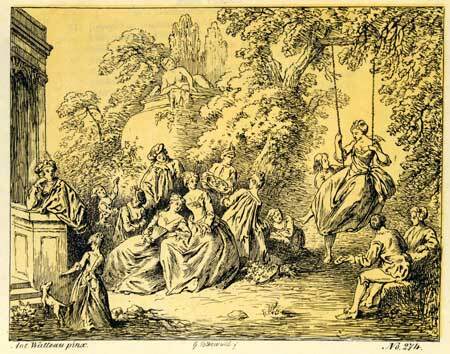 Georg Osterwald after “Watteau,” Amusements champêtres, c. 1865, engraving. The painting was engraved in the same direction by Georg Osterwald (1803-1884) at the time of the Essingh sale in 1865. Cologne, collection of Anton Josef Essingh (1787-1864; a person of means). 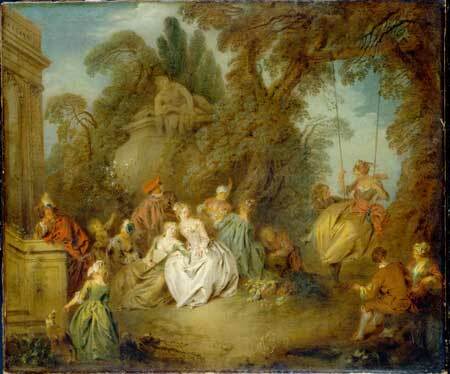 His sale, Cologne, Heberle, September 18, 1865, lot 274: ”Antoine Watteau . . . Amusements champêtres d’une société de haut rang du temps de Louis XIV. Des groupes de jeunes dames en riches robes de soie, les cheveux ornés de fleurs, munies d’eventails etc. se trouvent, en de charmants attitudes, au milieu d’un paysage, accompagnés de leurs cavaliers. A droite, une jeune dame se fait balancer par un jeune homme; à côté d’eux il y a un autre couple assis, le seigneur jouant de la guitare. Dans l’arrière-fond des parterres et des statues de marbre; à gauche, appuyé à une colonne un cavalier qui regarde ce qui se passé. Frankfurt, collection of Wilhelm Carl von Rothschild (1828-1901) and Freifrau Mathilde von Rothschild (1832-1924); donated by the latter to the Städelsche Kunstinstitut in 1924. Frankfurt, Liebieghaus, Gefährliche Liebschaften (2015) (as by Pater, Ländliches Fest). Frankfurt, Städelsches Kunstinstitut, Verzeichnis der Gemälde (1924), 154. Ingersoll-Smouse, Pater (1928), cat. 280 bis. Frankfurt, Städelsches Kunstinstitut, Verzeichnis der Gemälde (1966), 94. Sander and Hollein, Alte Meister 1300-1800 (2011), 199. Although the painting passed under Watteau’s name in the middle of the nineteenth century (and probably earlier), that merely points up how confused the conception of the master’s art was. At some point when it was in the Rothschild collection, the picture was rightly recognized to be by Pater. That attribution was duly noted by Ingersoll-Smouse and, rightly, the attribution to Pater has remained unchallenged ever since.